Tim Franklin, NJII's COO, guides a team through the Strategic Doing process. 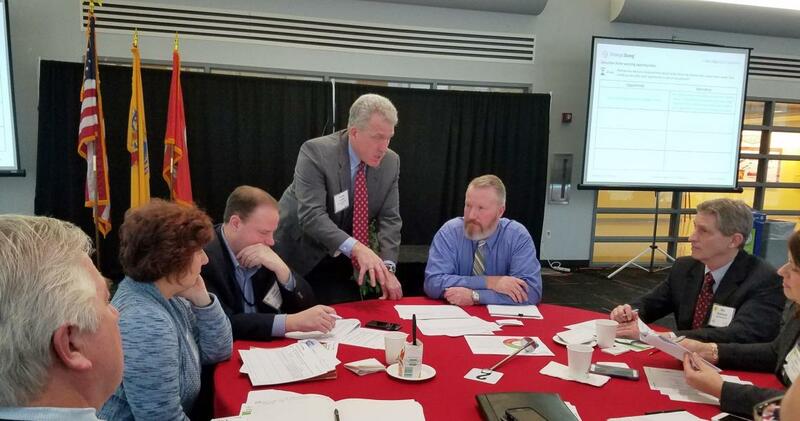 The New Jersey Innovation Institute (NJII), an NJIT corporation that applies the intellectual and technological resources of the state’s science and technology university to challenges identified by industry partners, held an Agile Strategy event focused on remediation Feb. 15. The event was held in partnership with a leading NJIT professor and center director. NJIT’s Michel C. Boufadel, director of the Center for Natural Resources Development and Protection (NRDP) and professor in the John A. Reif, Jr. Department of Civil & Environmental Engineering, focused on the fact that the remediation of contaminated sites is a major challenge in New Jersey and throughout the country. Although a great deal of success has been achieved thus far, a higher level of success can be reached if the discussion between industry, government regulators and researchers in various universities in the region is improved. More than 50 participants representing Fortune 100 corporations, federal and state regulators, consulting and contracting firms and researches from NJIT, Rowan, Rutgers and Drexel universities formed six multidisciplinary teams. NJII chief operating officer, Tim Franklin, led the teams in a process called Strategic Doing that is designed to enable participants to form collaborations quickly and move them toward measurable outcomes. Strategic Doing is an innovative approach to creating actionable solutions to complex challenges more rapidly than traditional planning disciplines.